"I like to make things." This amiable, soft-spoken Texan loves barbecues, guns, and higher education. Natural curiosity, ten years as a roughneck in the west Texas oilfields, and eleven hard science PhDs have trained him to design, build and repair a variety of deadly contraptions. Gang, I don't know who's responsible for setting the respawn timer on this server, but I feel like I've been waiting forever to get back into the game! Like, four and a half years. 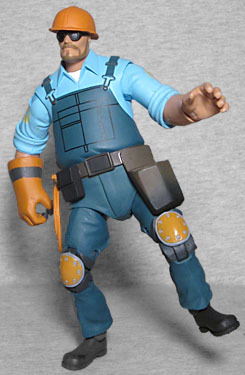 Jokes aside, it's not really NECA's fault: they had a nice thing going, alternating Reliable Excavation Demolition and Builders League United versions of their Team Fortress 2 figures, but after doing the RED versions of Series 3, they ran into a problem: Valve began dragging their feet on approving the release of the BLUs. So we really have been waiting since the end of 2013 for this pair to come out. Team Fortress 2 is, as you may be able to guess if you're as exceedingly clever as we are, a sequel to Team Fortress. That wasn't a real standalone game, but rather a mod for Quake released in 1996. And while the two games are mostly unrelated in anything but a gameplay manner, it turns out that Dell Conagher, here, is the son of the Engineer from TF1. 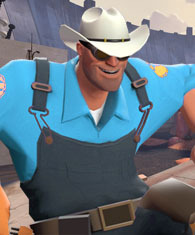 On the surface of it, the Engie doesn't seem like a great classs: he has mediocre HP, bog-standard movement speed, and a shotgun for his primary weapon. Yow! That's a recipe for getting dead. He's the smallest character on the roster, shorter even than the shrimpy Scout. Of course, he's bigger around the middle, because TF2 invented the "everybody gets a different silhouette so they can be identified at a glance even from a distance" thing. NECA, of course, is known for their highly detailed sculpts, but that's about duplicating reality, and in the case of TF2, "reality" is much simpler. Like if Pixar made an Itchy & Scratchy movie. Dell is wearing dark boots, blue overalls, yellow kneepads, a bron toolbelt, a light blue work shirt over a white tee, a pair of welder's goggles over his eyes, and a yellow hardhat. The hat is worn backwards for some reason, with the brim covering his neck instead of his face. He's also wearing a single rubber glove on his right hand, and since several of his alternate weapons replace that hand with a high-tech prosthetic, it's possible it's a robot hand under there already. 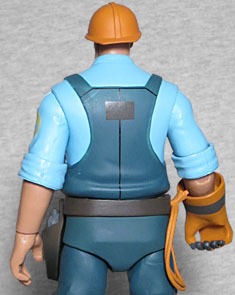 An extension cord is coiled on his right hip, and although the straps of his overalls are sculpted, the pattern on his chest (meant to represent stitched pockets) is only painted. That's less than ideal, isn't it? On the same note, his stubble is painted with too much definition, so it looks like a thin beard, not rough growth. It needs to blend out more. The articulation hasn't suffered any in the years we've been waiting for this toy to come into existence. The Engineer has balljointed ankles, double-hinged knees, swivel thighs, swivel/hinge hips, a balljointed waist, a balljointed right wrist (way down inside the glove), a swivel/hinge left wrist, swivel/hinge elbows and shoulders, and a balljointed head. The right wrist feels supremely wiggly, but that's just because it's a balljoint instead of the standard sort the other figures in this line have had - it holds its pose even when holding accessories. All the hinge joints are surprisingly stiff, taking a lot of force to move from one position to another. It does make us worry about breakage, a little. 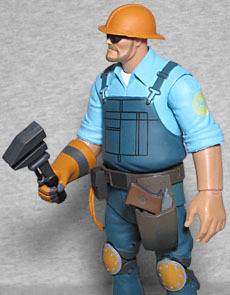 Engie has three accessories, which is more than most of the figures got, and yet still not enough. Are we being greedy? Perhaps, perhaps not. He comes with his standard secondary weapon, the pistol, and his stock melee weapon, the Uhlman Build-Matic Wrench. 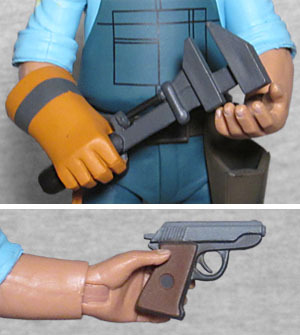 The pistol fits in the holser on his belt, which is a good choice, since neither of his hands is shaped to hold it. Whoops? The wrench is an old-fashioned monkey wrench, used prmarily for smacking things. It can be stored inside the third accessory, a big red toolbox. Which is good, exceeeeept... it should be blue. It changes color with the team affiliation, and BLU Engies carry blue toolboxes. So this accessory is an error. Still, at least we get it. 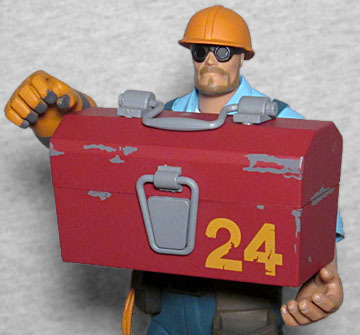 As mentioned above, Engie's personal stats aren't great, but he makes up for that shortcoming with his buildings: teleporters, sentry guns, and dispensers. You play an Engie, it's your job to move the team around, keep them supplied, and be the final line of defense. And to shoot everyone you see, because it might be a disguised Spy. Anyway, when you're in the process of placing your building, the animation shows the character running around lugging a toolbox, so this one accessory can technically represent all three types. The handle and latch are both working pieces, though the handle falls out easily. Other than being the wrong color, the deco is good, with scratched up, worn away paint. 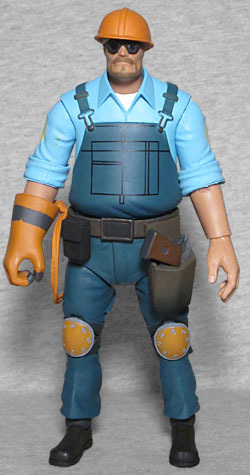 Still makes us wish for an accessory pack like Aliens and Predator have gotten, so the Engie can be complete. The set also includes a card (reproducing the Engineer poster art) that has a special code you can redeem for a free in-game item. Yes, everybody gets the same item. And since this is Team Fortress 2, the item is a hat. Specifically, the Texas Ten Gallon, a white cowboy hat that makes perfect sense for a guy from Texas. In the Pyro review, I promised to tell you about my #1 class when we got to it, and so we have: I've played hours more as an Engie than any other class. That's why I'm so bummed that he doesn't include any of his buildings, but also so relieved that I can finally add him to my collection. The paint could be better, both on his face and on his toolbox, but I'm just so glad to have this in hand at last that for now, neither of those are too bothersome.